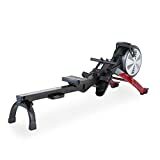 Offering a large variety of workout possibilities with 24 preset apps, and 10 levels of air resistance, the ProForm R600 rowing machine is an adjustable piece, which delivers comfortable training sessions keeping your fitness levels challenged every single time. The machine features a legible LCD display with Watts meter providing all the necessary feedback like calories, distance, resistance, time and more. The R600 can be folded easily to free some space due to remarkable SpaceSaver® folding design, and furthermore, the workout experience is additionally improved with an ergonomic handle with a non-slip grip, as well as good-sized footrests with straps.